Allie Emond, Gold Star wife of fallen Green Beret Eric Emond with Dan Magoon executive director of Massachusetts Fallen Heroes looking at the memorial for the first time before the ceremonies at the Massachusetts Fallen Heroes Memorial. 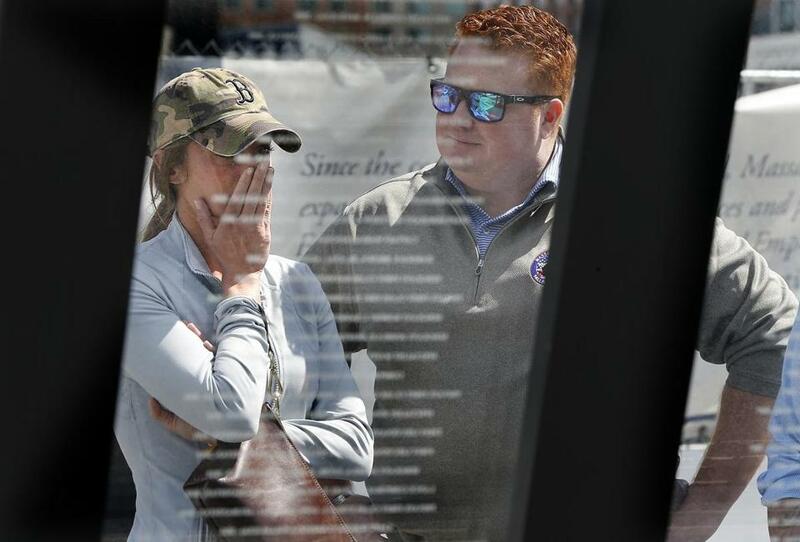 Allie Emond put her hand to her face as she looked at the memorial dedicated to hundreds of Massachusetts veterans Saturday in the Seaport, a tribute her husband had helped create. It was the first time she had seen the memorial since her husband — Army Sergeant First Class Eric Emond — died in a roadside bombing in Afghanistan last November. She wiped tears from her eyes. “Eric should be next to me, and not on a memorial,” she said later. On Monday, Emond, 32, will run her first Boston Marathon to honor her husband’s memory and help support Massachusetts Fallen Heroes, the organization he helped create. She’ll be part of a team of 24 people running on behalf of the group raising money for programs to benefit veterans and their families, and the families of service members who have died. “I want to do this to somehow honor my husband, and everything he did to start that,” she said. Emond, 39, a native of Fall River, was killed alongside two fellow service members, Army Captain Andrew Ross, 29, and Air Force Staff Sergeant Dylan J. Elchin, 25. Emond spent 21 years in the military and was on his seventh combat deployment when he died. His career included time serving in the Marines, before he joined the Army, became a Ranger, and then a Green Beret. Allie Emond, Gold Star wife of fallen Green Beret Eric Emond, will run her first Boston Marathon on behalf of Massachusetts Fallen Heroes, an organization that was co-founded by her late husband to support Gold Star families. The couple met in Boston and were together for 10 years, she said. They bought a home in the city and started a family. “He just brought life and humor to every place he went,” Emond said. Emond spoke to reporters Saturday afternoon at the Massachusetts Fallen Heroes Memorial on Northern Avenue in the Seaport. The veterans group has stood by her and the couple’s three young daughters, who now live in Southern Pines, N.C., she said. Part of the Seaport memorial features a series of glass panels, each etched with the names of service members who have died since Sept. 11, 2001. The memorial was created by Massachusetts Fallen Heroes, which was launched in 2010 by a group that included veterans and Gold Star families, as well as Boston firefighters and police officers. Eric’s name will be added to the memorial in time for a rededication planned for next month, said Dan Magoon, the group’s executive director. The memorial lists nearly 300 names, he said. Magoon, himself an Army veteran who served in Iraq and Afghanistan, saw Emond as a mentor as they helped found Massachusetts Fallen Heroes, initially to support Gold Star families. The organization now offers programs that help veterans and families access educational, employment, medical, financial and other services, according to the group. The group solicits donations through its website, massfallenheroes.org, he said. Their goal was “to make sure that we can be there to help those families, and now help veterans, when we hear that pain in their voice,” Magoon said. Allie Emond’s visit to Boston is difficult — it was the first without Eric by her side, she said. 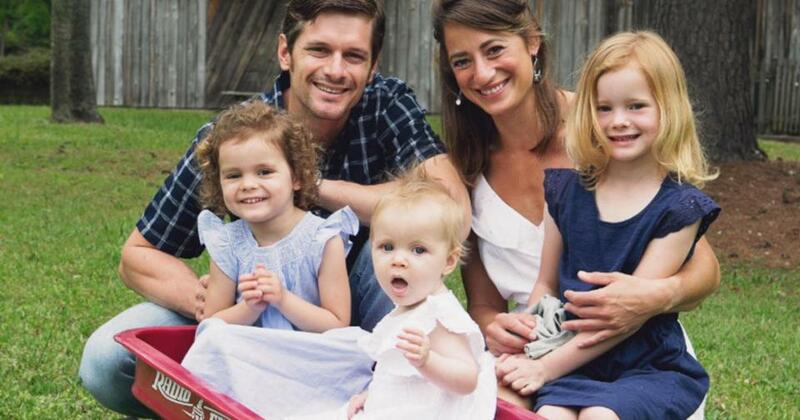 And their daughters — now ages 7, 4½, and 1½ — now face life growing up without their father, she said. Emond wants to run so others remember the ultimate sacrifice made by people like her husband, who died to keep their country safe. “He just wanted to help the families that are in my shoes right now,” she said. Danny McDonald, John Ellement, and Kevin Cullen of the Globe staff contributed to this report. John Hilliard can be reached at john.hilliard@globe.com.